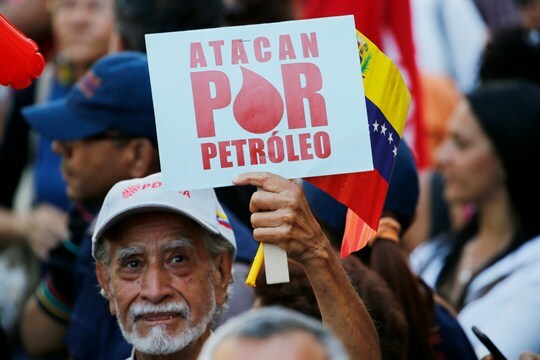 A man holds a sign that reads in Spanish “They attack for oil” during a march in support of the state-run oil company PDVSA, in Caracas, Venezuela, Jan. 31, 2019 (AP photo by Ariana Cubillos). Weeks into Nicolas Maduro’s disputed second term as Venezuela’s president, his prospects for political survival appear more uncertain than ever. Many countries, including the United States and many South American and European countries, have recognized opposition leader Juan Guaido, president of the National Assembly, as the legitimate interim president, as he declared himself last month. It is risky to predict the end date of a regime whose leadership has already weathered nearly six years of economic crisis, but if it is approaching, there should be plans for reviving the economy of an oil-rich but desperate nation.